Other Products by MAXS Supplements. Search other Pre-Workouts products. Max’s Betapump Red Alert contains a host of powerful pre-workout ingredients to help you blast through your training sessions. Its contains a specialised nitric oxide support system, which includes agmatine, arginine and citrulline. This truly is three-tiered support for blood flow to your muscles and the pumps that come with it. Citrulline is rapidly absorbed and converted to arginine, which is then used by an enzyme called nitric oxide synthase for the production of—you guessed it—Nitric Oxide (NO). Some research has actually indicated that citrulline is more effective at elevating blood arginine levels than arginine supplementation1. This is likely due to differences in first pass clearance, meaning that citrulline is cleared to a lesser degree than arginine after absorption. 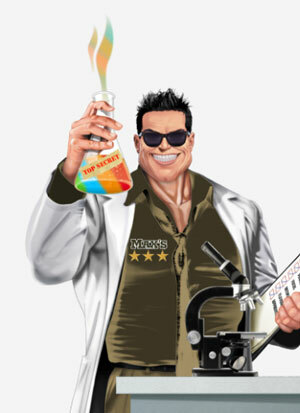 Agmatine, the other powerful NO booster found in Max’s Betapump Red Alert has been shown to increase activity of this powerful enzyme, therefore enhancing NO synthesis. Therefore, this product provides the precursors (building blocks), and stimulates production (the builders), of this gas that is synthesized in our blood vessels. NO causes relaxation of smooth muscles (not the muscle you lift weights with) that control dilation and constriction of blood vessels. Hence, when smooth muscles relax, blood vessels dilate, allowing more blood to flow to your muscle tissue, which intensifies nutrient delivery, waste removal and muscle pumps. 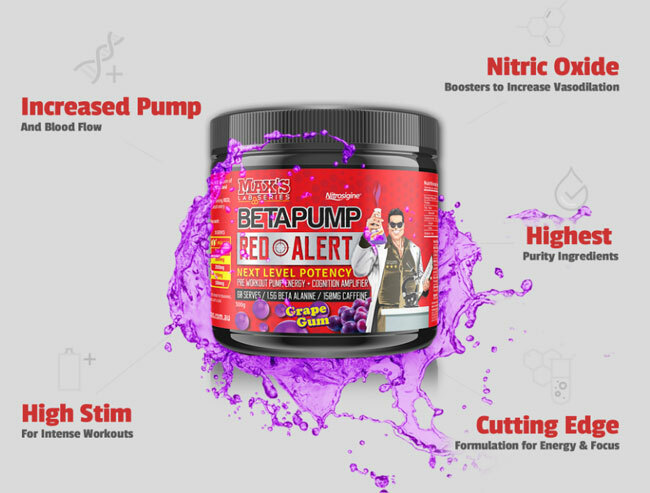 Max’s Betapump Red Alert contains a moderate amount of caffeine, allowing you to tailer the dosage to your needs with one or two scoops. What level of caffeine works for you completely depends upon your caffeine sensitivity and bodysize. For example, a 150kg powerlifter usually needs a bit more than a 50kg ballerina! This pre-workout contains 150mg of caffeine per 5g scoop. Caffeine provides the energy kick-start that we sometimes need to train, particularly after a long day at work (tradies and labourers know about this). Natural neurotransmitter support is included in Max’s Betapump Red Alert, with ingredients such as N-Acetyl-Tyrosine, Alpha-glycerophosphacholine and Huperzine A, which support the neurotransmitters Dopamine and Acetylcholine. These help to improve mood and focus and concentration, naturally. No pre-workout would be complete without creatine. This important dipeptide, produced from glycine and arginine, supports the phosphocreatine energy system, which is the anaerobic (oxygen exclusive) ATP generation pathway. If you are into lifting weights or performing any workload at full capacity for 10-15 seconds or less, then you are relying heavily upon this energy system. Pure creatine monohydrate provides the creatine for this crucial phosphocreatine molecule. This may also make it faster for you to recover from heavy weight lifting, or calisthenics, reducing the need for your own metabolism to manufacture its own. Research has demonstrated that benefits can be attained from creatine supplementation for bouts of activity that last up to 3 minutes2. Though creatine is found in the diet through foods such as fish (an underrated source) and meat, a little extra can go a long way when you are pushing your body to the max! This product also contains Beta-Alanine, the rate-limiting precursor for Carnosine production, which is a muscle-specific antioxidant protein that also buffers lactic acid. This may help to improve aerobic training and can also give your skin a light tingle along the way, just for fun! 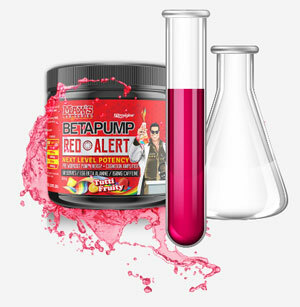 Max’s Betapump Red Alert is a fantastic addition to a solid range of sports supplements from a company that never delivers any less than exceptional. Take 1-2 scoops 30min before exercise, ideally before lunch or depending on your caffeine tolerance. To assess tolerance, please start on 1/2 scoop.